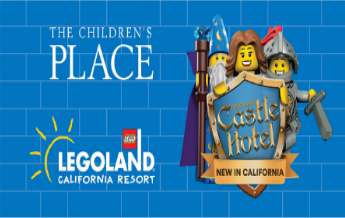 The Children’s Place LEGOLAND Castle Hotel Sweepstakes – Win a trip to LEGOLAND California & more! Win a trip to LEGOLAND California & more! ENTRY LIMIT – Limit of one (1) Sweepstakes Entry per person, per email address, per day, throughout the Promotion Period for a total of twenty two (22) Sweepstakes Entries. SWEEPSTAKES ENTRY PERIOD – The Children’s Place & LEGOLAND: LEGOLAND Castle Hotel Sweepstakes (the “Promotion”) begins at 09:00:00 AM Eastern Time (“ET”) on April 2, 2018 and ends at 11:59:59 PM ET on April 23, 2018. Note: If winner resides within 100 miles of LEGOLAND California, the check will not be provided but Merlin will provide a car rental for the duration of the family’s trip instead. The Approximate Retail Value (“ARV”) of the Grand Prize is $4,251 USD/$5,312.09 CDN. The ARV of each Runner Up Prize is $530 USD/$649.81 CDN.